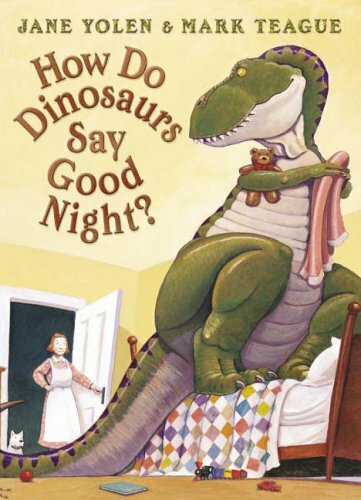 Do young dinosaurs play up at bedtime? Yolen’s slightly forced rhymes are more than offset by Mark Teague’s brilliant illustrations. He has an amazing ability to create realistic dinosaurs that can convey complex emotions such as coyness and refusal. The resigned and weary expressions of the (human) parents perfectly sum up the fatigue that parents often feel at the end of the day, particularly when they need to deal with a recalcitrant child. The end result is a hilarious set of illustrations depicting parents (of different ethnic backgrounds) who clearly love their enormous dinosaur children. (Helpfully, each species of dinosaur is named.) This is a board book version of a picture book first published in the UK in paperback.